There are lots of free/paid video downloader softwares all over the internet and even free online services but what makes us share Wondershare vDownloader with you is - easy to use, simple interface, and it's a Freeware. Wondershare vDownloader is a very handy application allows you to download videos from websites such as Hulu, DailyMotion, YouTube, Vevo and more. There are two ways of working with this software. Firstly, there are browser plugins available for Internet Explorer, Firefox and Chrome, which gives you a dedicated download button. The second option is to simply copy the URL of a video you want to download, vDownloader monitor the clipboard when it's running, so as soon as you copied the link, it will start downloading in seconds. 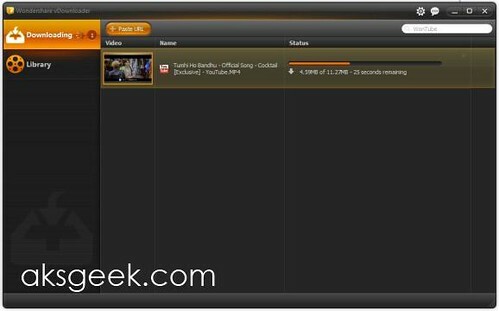 The interface contains two tabs - Downloading, which shows the list of video you're downloading (allows maximum 20 downloads simultaneously, default is 5) and Library contains all your downloaded files and can be played in its integrated player. You can even search videos on WonTube through Wondershare vDownloader interface, which search videos around the web. But we will love to see the other search options in the list like YouTube, DailyMotion and others. What we like about Wondershare vDownloader? Doesn’t allow us to choose a file name up front. Include only WonTube and missing other video sharing sites in search options like YouTube, DailyMotion and more. Search results doesn’t display in interface itself. Normally save files in MP4 or FLV format, doesn’t allow us to choose different format or convert file in other format. Wondershare vDownloader is free, simple, easy to use software, which completes your basic need of downloading videos online and it's a must have for any user who's looking Free Video Downloader.